The first Temple Run mobile game by Imangi Studios has been a huge hit with kids everywhere, even though it’s not technically a kids app. Now parents and kids can rejoice, because the new Temple Run 2 recently hit the app store! 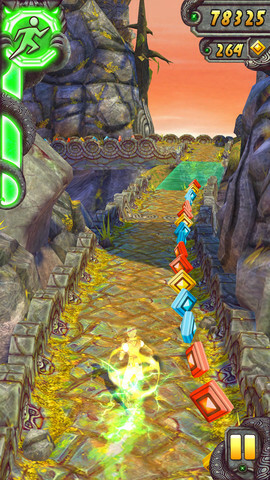 Graphics- Noticeably brighter and crisper, the graphics in Temple Run 2 have been much improved from the original game. Environments- Beautiful, lush new environments make Temple Run 2 gorgeous and inviting. New Obstacles- Because your kid is probably better than most adults at jumping over those tricky holes, Temple Run 2 has added new obstacles to provide a more challenging and unique in-game experience. More Achievements and Power-ups- Additional achievements keep the game interesting while more power-ups help you achieve faster runs and longer jumps! Special Powers- Now, each character has his or her own special powers, adding a sense of strategy to the original game. Gems and coins are still a part of the game, however they aren’t essential to actual game play and are only used to unlock new characters and power-ups. Users aren’t bothered by prompts or ads advertising their availability, making Temple Run 2 a good ‘free app’ choice for parents who want to avoid in-app purchases. Temple Run 2 makes a great competitive game for families with multiple children or parents who enjoy a good competition and want to beat each others high score. Indeed, fun for the whole family! 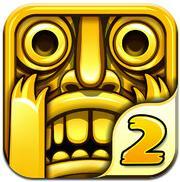 Temple Run 2 can be downloaded for free via the Apple iTunes button below. This app is available for both iPhone/iTouch and iPad platforms.